(MP175). Commander Eric Tufnell RN (1888-1979). 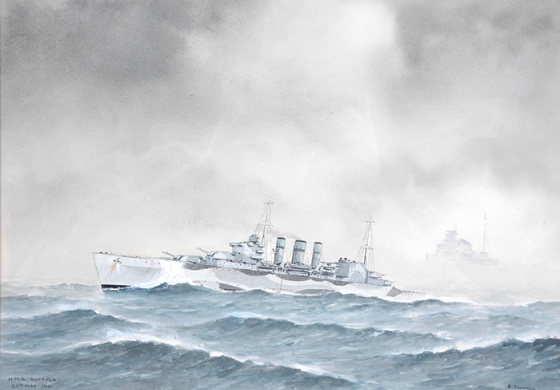 Watercolour signed (LL) and inscribed "HMS SUFFOLK, 23rd May 1941". Limited edition: 12 copies worldwide. Standard size: 14 x 10 inches (35.5 x 25.5 cms) approx. At 1000 on 23rd May 1941, with SMS BISMARCK (Captain Ernst Lindemann) wearing the flag of Admiral Gunther Lutjens and SMS PRINZ EUGEN (Captain Helmuth Brinkmann) reported by signal from the Admiralty to be breaking out and thought to be steering for the North Atlantic via the Greenland/Iceland/Faeroes gaps, the 8 inch cruiser HMS SUFFOLK (Captain R M Ellis RN) completed refuelling in Hvalfjord, Iceland. She joined her sister, HMS NORFOLK (Captain A J L Phillips RN) wearing the flag of Rear Admiral W F Wake-Walker CB OBE (Rear Admiral 1st Cruiser Squadron) off northwest Iceland and shortly afterwards both ships sailed to take up separate patrol barriers across the Denmark Strait to try and locate the German squadron. Later that evening in freezing, patchy fog which limited visibility to no more than half a mile (500 metres) and amongst the murky shapes of passing ice-floes SUFFOLK’s newly fitted type 284 radar came up with the goods: two large contacts steering south west at high speed and at a range of approximately 10 miles. The cruiser put on hard port wheel, made smoke, went to action stations and bolted back into the cover of the fog before taking up station astern of the contacts and transmitting an Enemy Contact Report to Admiral Tovey in KING GEORGE V, Admiral Holland in HOOD and Admiral Wake-Walker in NORFOLK. Admiral Lutjens was aware he had been detected, albeit very briefly, so he too started evasive manoeuvring. Just as SUFFOLK had to remain intact and on the Germans’ tail so that she could successfully home in heavier forces, so also was BISMARCK keen to avoid an action which would in any way impair the speed and manoeuvrability of her squadron and put its breakout into the shipping lanes at risk. Shortly after that initial radar detection and with the range of BISMARCK decreasing rapidly and the cruiser now taking avoiding action to try and open the distance again, Able Seaman Alf Newall, the starboard after bridge lookout in SUFFOLK, got a brief visual glimpse of BISMARCK as she loomed menacingly out of the freezing fog. This is clearly the scene that Tuffy has painted here: its 1915 on 23rd May and AB Newall has just shouted “Ship bearing green one-four-oh-degrees, near”: whilst PRINZ EUGEN remains hidden up ahead of BISMARCK the threatening bulk of the latter clearly shows through the gloom to the right of the picture moments before she put several 15 inch salvoes down the bearing at SUFFOLK. Once again, Captain Ellis - whose clear task, come what may, was to cling onto the German squadron and report its position, course and speed to his superiors - put his wheel hard over, rang for maximum speed and dived into the fog!